Hyundai Verna launched by Hyundai Motors India Ltd has been significantly successful in dominating Indian market. The most successful feature of the car is its powerful engine technology. The car is available in two petrol and three engine variants. 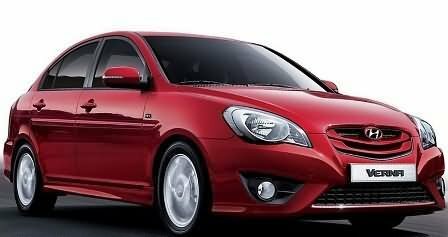 Appearance: Hyundai Verna is available in 6 striking colors – Blushing Red, Crystal White, Stone Black, Sleek Silver, Champagne Gold and Deep Ocean Blue. The full wheel cover, rear chrome garnish, chrome insert in waistline moulding, stylish radiator grill and alloy wheels – all add to the elegant look of the car. Comfort: The car has several comfort features. The leather wrapped steering wheel, dual height adjustable driver’s seat, 60:40 split folding rear seats, keyless entry, automatic temperature control lead to increased comfort. Verna also has a state- of- the- art audio console with 2 DIN music system, along with 4 speakers and 2 tweeters. Safety: Various safety features of the car include – Clutch Lock System, Front Fog Lamps, Child proof rear door locks, Central Locking System and Collapsible Steering Column. The advanced safety features include Side impact bars, Anti submarine seats, Front Ventilated Disc Brakes, Seat belt Warning Lamp, Door Ajaar Warning Lamp, Height Adjustable Front Seat Belts with Pretensioner and ABS (Antilock Brake System). The car is fitted with Gas type shock absorbers with the Mac-Pherson Strut with Coil Spring and Anti Roll Bar suspension at the front and Couple Torsion Beam Axle suspension at the rear. Engine: The petrol variants have 1.6 L, VTVT petrol engine with five speed manual transmission gear box. The engine produces 103.2 PS at 5,500 rpm of maximum power with 14.9 kgm torque at 3000 rpm. The diesel variants feature 1.5 L, 1493 cc, CRDi VGT diesel engine with five speed manual transmission gear box. The engine produces 110 PS of power at 4000 rpm and 24 kgm of torque at 1900~ 2750 rpm. Hyundai Verna 1.6 SX VTVT – Rs.7,67,539. Hyundai Verna 1.6 VTVT – Rs.6,87,754. Hyundai Verna CRDi – Rs.8,26,009. Hyundai Verna CRDi SX – Rs.8,79,216. Hyundai Verna SX CRDi AT – Rs.9,46,411. The above specified are various models of Hyundai Verna along with their tentative prices. However, these are just approximate prices which exclude – tax, registration, insurance and cost of accessories.